Companies spend over $120 billion each year printing forms and the average office worker uses 10,000 sheets of paper each year. Aside from the paper itself, there's the operational costs of administrative time spent re-entering or searching for data, and other inefficiencies. The ability to collect and submit the data and forms needed for your business digitally eliminates your paperwork, and improves data quality and operations. Mobile forms give you the flexibility to replace and automate your existing processes, and send data in real-time from a mobile device. Here's how you can get started turning your paper forms into mobile forms. 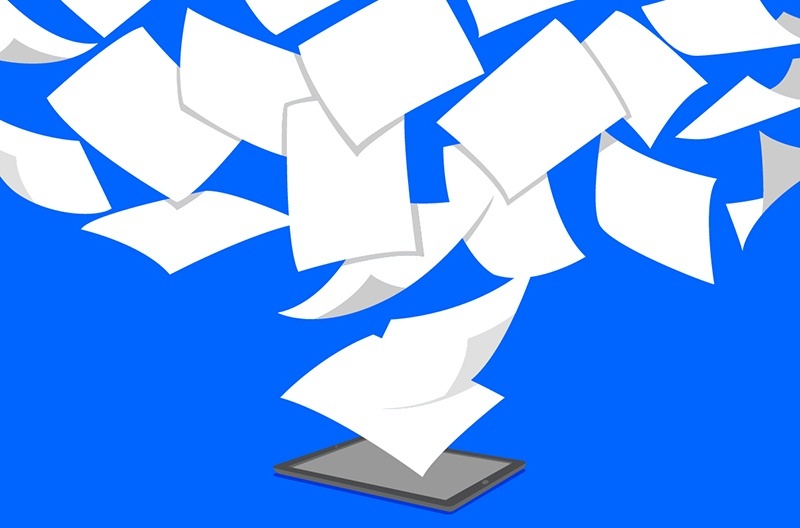 Paperwork is received 25% slower and has 50% more errors than mobile forms. There's also the risk of errors being made during data entry, or worse, forms getting lost or damaged. But the problem doesn't stop at paper. Sometimes critical data isn’t being collected at all, which can be a major problem for business. Identifying this problem with paper or your business workflows is the first step. Then it's time to make a change. Using mobile forms for mobile data collection can replace paperwork and legacy or non-existent data collection processes with forms that your team can complete on mobile devices from anywhere. Device Magic's mobile forms app allows you to turn your paperwork into mobile forms in just a few steps. With Device Magic, you can collect data on mobile devices, even when offline, and deliver it to the office in real-time. When you're ready to start digitizing your forms and processes make sure to choose a goal. What are you trying to achieve by going mobile? Are you trying to reduce the number of forms techs need to carry with them to service calls? Do you want to start collecting data so you can audit the effectiveness of a process or program? Having a specific goal will help you to prioritize and get up and running with mobile forms faster. You'll also want to make sure that the form or process you choose is something that is used regularly, so you'll see a high impact right away. For more help getting started with mobile forms, check out this webinar. After you've chosen the form or process you'd like to start with, you can use a web-based form builder to convert your paper forms into mobile forms, no coding or exstenive technical knowledge required. Device Magic's form builder features a drag-and-drop interface that you can use to create your forms. Recreate your checklists, inspection forms, maintenance requests, time cards, and more. You can easily build mobile forms that resemble your paper forms. But a major benefit of mobile forms is the other types of questions and data you can capture; collect GPS locations for where forms are submitted, take a photo and then sketch notes on it within the form, use calculated questions to find the difference between two answers, and make questions required so that you always get all of the information you need. To build a form, just select the question type from the list on the left side of the Dashboard and drag it into the form screen. You can also re-order or delete questions as needed. The form builder preview is a helpful feature that gives you an idea of what the form you're building will actually look like on a mobile device, so you can make it as easy as possible for your team. Once you're done building a form, it will be available to complete within the mobile forms app on your team's devices. You can also create user groups so that people only have access to the specific forms they need. Once you create a form, you can share it across all of the devices associated with your account, or make it available for only the specific devices or users you choose. Collecting data using multiple tools that aren’t integrated is extremely inefficient and slows your business down. Mobile forms allow you to build advanced workflows and enterprise integrations that weave mobile submissions into an existing data flow. A Destination is where your data will be delivered once it has been submitted with the mobile forms app. You can set up Destinations after building a form and also customize the data format. 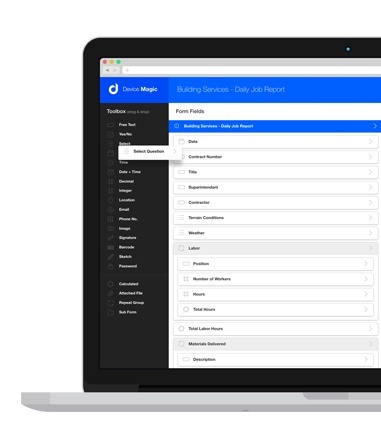 Device Magic has built integrations with many of the tools and systems your business is using, so you can send submission data where it needs to go, eliminating data re-entry and saving time. Whether it’s photos from the job, a completed inspection form sent as a PDF, or sales data entered into your CRM, it can call be delivered to the platforms you use as soon as it’s collected. No more re-entering handwritten notes into a computer or waiting for paperwork to come in. Learn more about Integrations. With your forms built and Destinations set you're ready to start collecting data. In a recent survey, 71% of businesses found that getting access to accurate data sooner was a top benefit of using mobile forms. With your processes converted you can stop wasting time on paperwork and unaccessible data and get back to what matters most for your business. Want to use Device Magic for YOUR organization? Start a free 14-day trial today.